Where is the Bonanza Cast Today? Bonanza was a popular western television series that ran for 14 seasons consisting of 431 episodes between 1959 and 1973. It is the second-longest running western television series on network television in the United States. The series was created by David Dortort and the storyline was set in the 1860s. 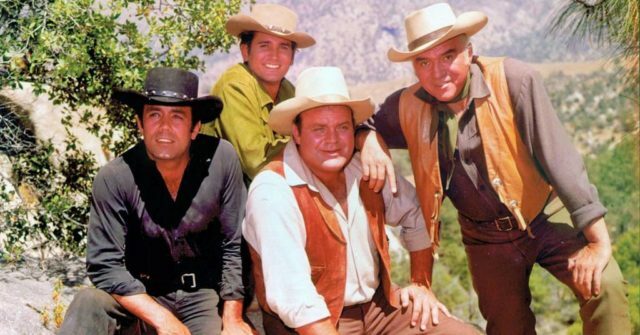 It focused on the Cartwright family, who were played by Lorne Greene, Pernell Roberts, Dan Blocker, and Michael Landon. Ray Teale also starred in this series. If you were once a fan of this series, you may have wondered what has happened to the cast since the show finished. Here is what the main cast of ‘Bonanza’ did after the western ended. Lorne Greene played the role of Ben Cartwright. When ‘Bonanza’ ended, he played a police officer in ‘Griff’, which ran for only 13 episodes. His next job was as the narrator of the documentary ‘Last of the Wild’ between 1974 and 1975. He then starred in the 1977 miniseries ‘Roots’ and then played Commander Adama in ‘Battlestar Galactica’ and ‘Galactica’. Greene also starred in ‘Code Red’. He narrated the documentary ‘Lorne Greene’s New Wilderness’ for Canadian television. Lorne Greene died in Santa Monica, California, on September 11, 1987. Pernell Roberts played the role of Adam Cartwright, the oldest of the Cartwright sons, from 1959 to 1965. For many years after leaving the show, he predominantly worked in theater with the exception of appearing as a guest star on some television shows. In 1979, he landed the lead role in ‘Trapper John, M.D.’, which he played until 1986. In 1988, he co-starred in ‘The Night Train to Kathmandu’ alongside Milla Jovovich. Roberts also narrated several documentaries. Although Pernell Roberts married four times, he had only one son. He died in Malibu on January 24, 2010, at the age of 81. Dan Blocker played the role of Hoss Cartwright and it was for this role that he was best-known. Sadly, the end of ‘Bonanza’ also marked the end of this actors career as shortly after the series ended, Blocker tragically died. He suffered a pulmonary embolism and passed away in Los Angeles on May 13, 1972, at the age of 43. Michael Landon is best-known for playing the role of ‘Little Joe Cartwright’, the youngest of the Cartwright boys, in ‘Bonanza’. Following the end of this series, he continued to have a successful career in television. Landon is especially well-known for playing Charlie Ingalis in ‘Little House on the Prairie’ between 1974 and 1983, and for playing Jonathan Smith in ‘Highway to Heaven’ between 1984 and 1989. He also had many smaller television roles and also worked behind the camera in the capacity of a director. In his personal life, Landon married three times and had nine children. Michael Landon died from pancreatic cancer on July 1, 1991, in Malibu, California. Ray Teal played the role of Sheriff Roy Coffee in the series and it was for this role that Teal was best-known. Following ‘Bonanza’, Teal had only a few small acting jobs and he retired just two years later. Sadly, Ray Teal passed away on April 2, 1976, in Santa Monica, California.